Success in online video is relative to how much time, effort, and money you put into it. Andrew Baron of Rocketboom offers the (albeit self-serving) chart at right in a post updating the State of the Union for his startup and online video in general. I like this chart because it tries to compare the total capital poured into four different online video ventures and the total cumulative videos put out and consumed by viewers. Next New Networks is by far the largest, with an estimated 1 billion cumulative video views, but it’s also raised $27 million in venture capital (weren’t they supposed to be bought by YouTube by now?). Revision3 and Rocketboom come in at the next tier with 312 million and 290 million cumulative video views, respectively. A decent accomplishment by both, but it took Revision3 about $10 million in capital to get there whereas Rocketboom got there with only $1.5 million. And then there’s MyDamnChannel, with 105 million cumulative views and $7.5 million in capital invested. Not very capital efficient at all, assuming revenues are tied to video views, which is usually the case. In order to better visualize the ratio of cumulative views to total invested capital, I created the chart below based on Baron’s original one. Here you can see the capital efficiency better in terms total video views per dollar invested. 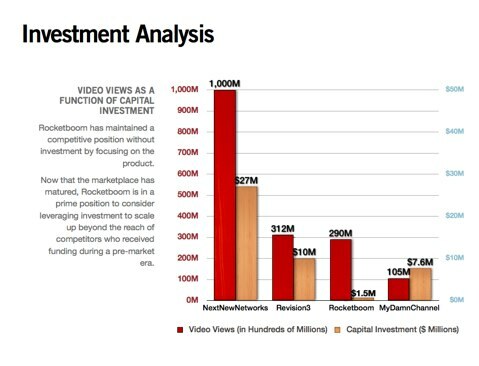 Over its lifetime, Rocketboom has attracted 193 views per dollar invested, compared to 37 for Next New Networks, 31 for Revision 3, and 14 for MyDamnChannel. 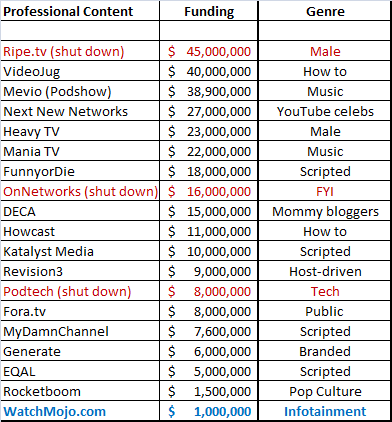 That’s pretty good for a bootstrapped startup, but Rocketboom still only produces one show (albeit daily), compared to a whole roster of shows for Next New Networks and Revision 3. Is Rocketboom pofitable? Baron says, “We’re still here.” And the company, which also operates KnowYourMeme and Mag.ma, is living off revenue since last September. It’s capital efficiency has gotten it this far, but I wouldn’t be too surprised if Rocketboom taps outside investors to help take the company to the next level, just as online video advertising starts to finally take off. 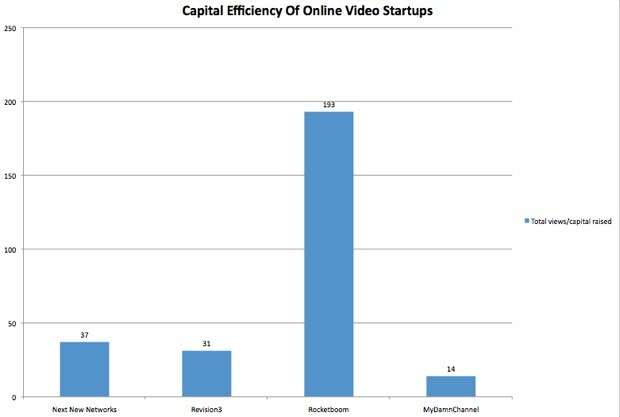 Update: Predictably, other online video startups are taking exception to this chart because they are not included. WatchMojo CEO (and occasional TechCrunch contributor) Ashkan Karbasfrooshan offers up the following stats for his bootstrapped video startup: 225 million video views (not including another 75 million autoplay) and only $1 million invested. That would give WatchMojo a ratio of at least 225 in the chart below. He also sent me a handy table of online video startups and how much money they’ve raised, which I’ve added below.